Poster - Town Meeting!! Illegal Immigration Combat It!!! 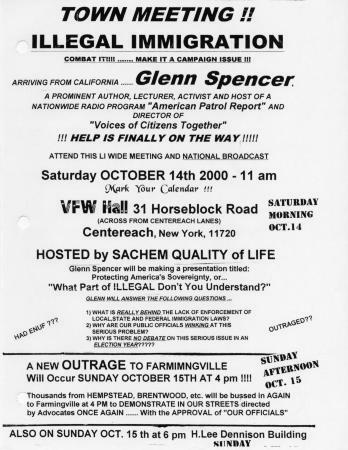 Sachem Quality of Life poster announcing the appearance of Glenn Spencer, host of a radio program called, "American Patrol Report," at a "LI wide" town meeting on illegal immigration, where he was slated to present on the lack of enforcement of immigration laws. The poster also stated that there were people being bussed to Farmingville, N.Y. on October 15th to demonstrate, and that they had legislative approval. The poster called this a "new outrage. ";According its statement of philosophy and mission, Sachem Quality of Life was founded as a response to "government, by their action and/or inaction, [having] allowed the quality of life in our Brookhaven communities to disintegrate by allowing 'open air' hiring halls on our streets and overcrowded slum housing to propagate in our communities. ";The poster made its point with capital letters, exclamation points, and bold text. Source: Hofstra University.The Farmingville Collection, 1996-2005. Box 26, Folder 6.